Designed to provide a nutritional treat or reward for goats. A fun, nutritious snack for your goats. 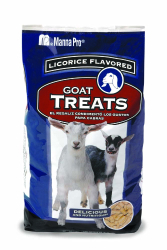 Made with real anise, delivering a licorice flavor goats can't resist. Easy to feed nugget form.